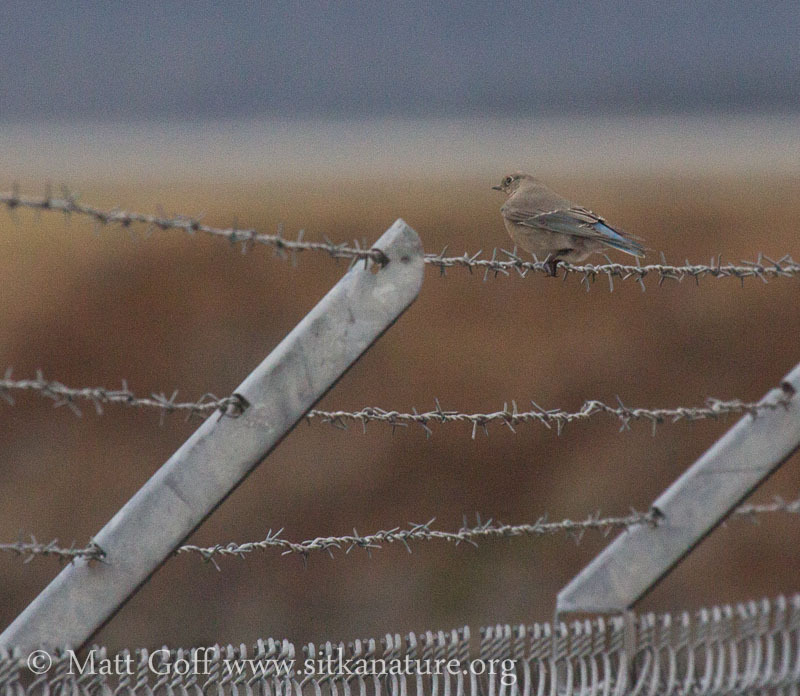 Yesterday I got a report with some photos of an unusual bird with a blue rump out along the old airport road. 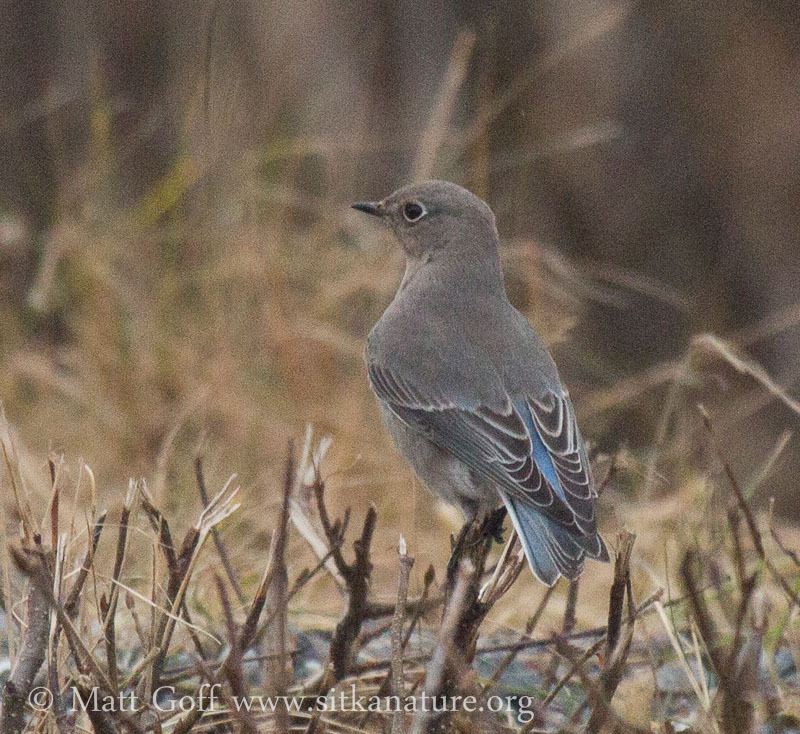 It was not especially cooperative, but the photos were strongly suggestive of Mountain Bluebird (at least to people who were familiar with that species, which I wasn’t so much at that time). I only had about an hour of fading light to check out there, and didn’t have any luck finding anything. Though I was not especially optimistic, I thought it was worth the effort to check around the area again this morning. My kids and I started from long term parking, did not see any evidence of the bluebird there, so walked a long loop around Japonski Island, then Alice Island. Along the way we saw a fairly late Yellow-rumped Warbler and more Savannah Sparrows (at Alice Island) then I would have expected. As we were walking along the old airport road, a jet landed and as it went by a bird flew up to a utility wire near the airport sand piles. 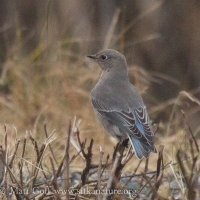 It looked suspicious, and I was able to get a better look to confirm it was the Mountain Bluebird. It was very active, flying from a perch down to the ground and back up to another perch. As it did this it moved down the road towards Alice Island. It never stayed long in one spot, and as a result was hard to approach, though I did not really have the impression that it was really trying to get away. Despite this, I was able to get a few photos, the best of which I’ve included with this post. I had somewhere to be at noon, so I let my kids follow it to the Alice Island loop road (where they lost track of it) while I went and got the car. In the afternoon I had some time, so went back to watch for it again. It didn’t show for a while, but as light was starting to fade, I noticed it on the fence at the long-term parking lot. From there it followed the pattern I had seen earlier, flying down to the ground, then back up again. This time it kept going back to the fence, but went a little further down each time. I was able to keep track of it until it got to the fence near the lagoon, but by that time it was getting dim enough I didn’t have much hope of getting better photos, and needed to get going anyway. If the weather is not too dreary and time permits I may try again tomorrow, though it’s hard to say if it will stick around. Thanks to Karen J. for noticing this bird seemed unusual and reporting it. This marks the sixth life bird for me this fall/early winter, and it seems unlikely I’ll have another season like this in Sitka (absent a trip off shore). It’s always exciting to get to see new birds around here, and I’m grateful for the chance to do so. 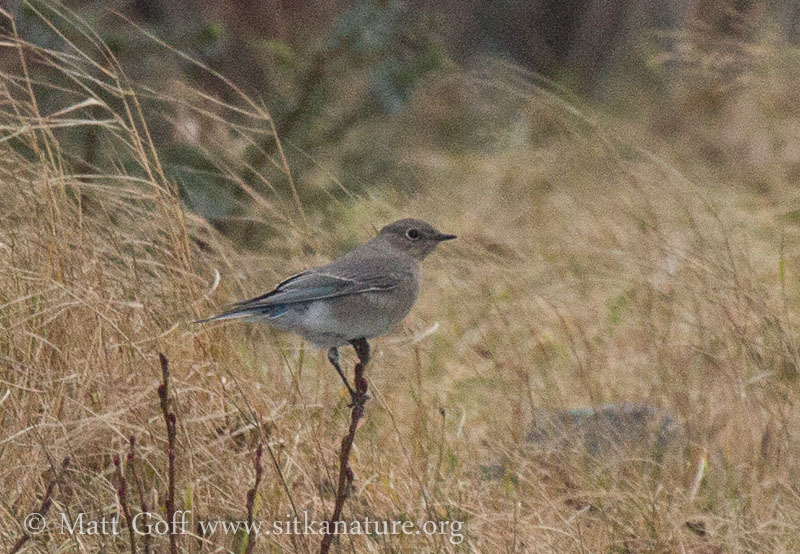 I’m also grateful to the folks who have helped facilitate seeing them, as well as those who have shared in the excitement of finding new and/or unusual species for Sitka. This entry was posted in birding, birds. Bookmark the permalink. 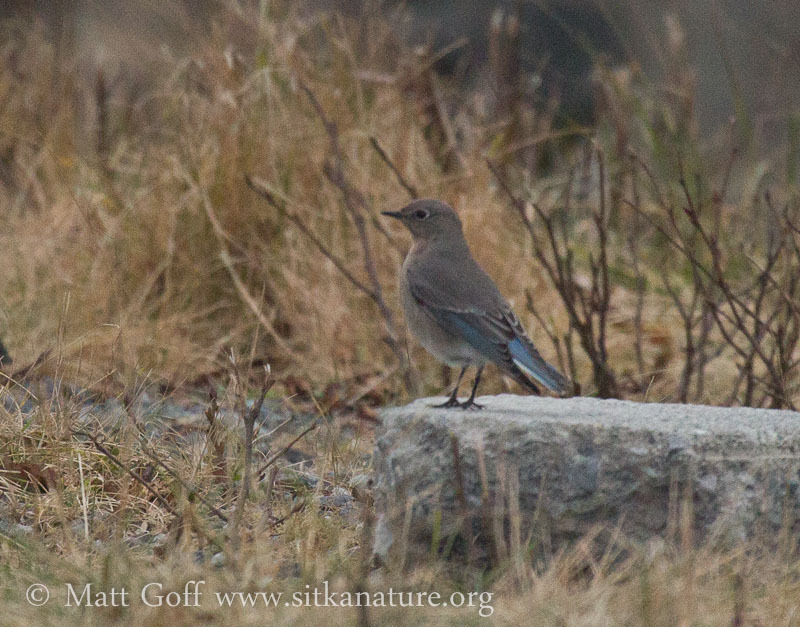 Do you mountain bluebirds usually travel individually or in small or large flocks? From where might it have come? 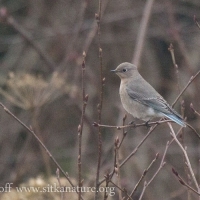 Any record of how long the others that were sited in the Sitka area stayed? 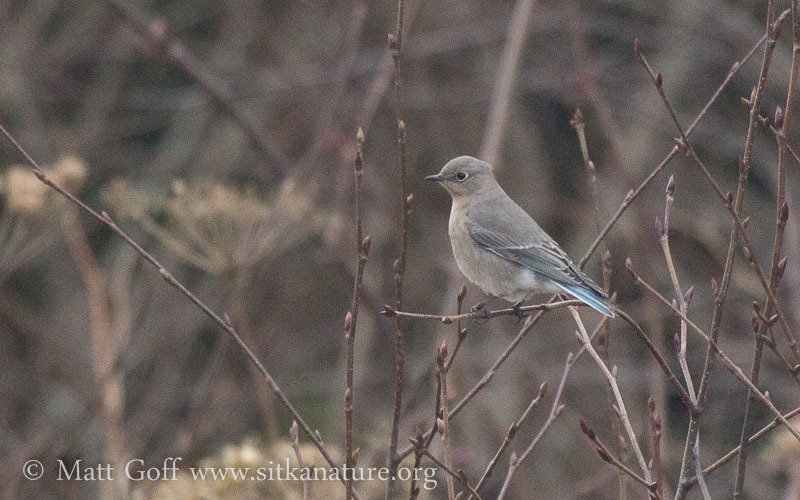 I’m not sure whether they typically travel in flocks or alone – the birds that have been reported from Sitka have all been individuals, though. 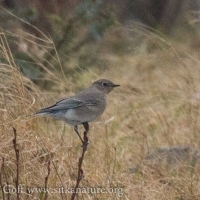 The most recent prior record was a bird that stuck around for several days, I’m not sure about the other ones – as far as I know, they were only seen once (but that doesn’t mean they weren’t around for longer). 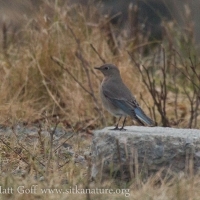 Mountain Bluebirds do nest in the eastern Interior of Alaska, they are regular migrants along the northern inner mainland of Southeast Alaska (Juneau and Skagway at least). 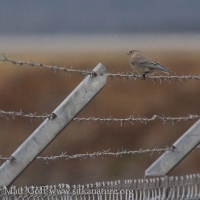 It’s hard to know where this bird came from – it could be a vagrant from the south that went the wrong way, or a migrant from the north that got off course somehow.